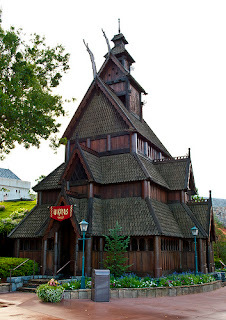 One of my favorite places in all of Walt Disney World is The Stave Church in Norway. 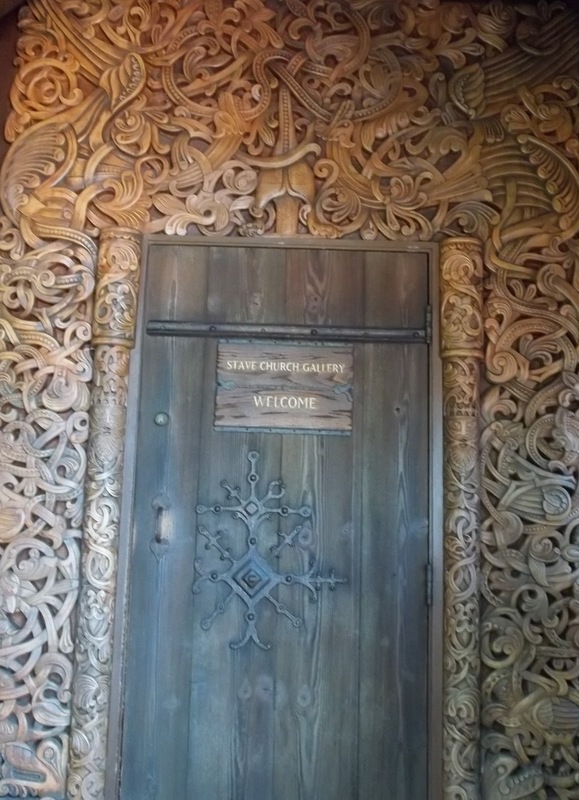 Countless people pass by this favorite each day, unaware of the hidden gem that lies behind the wooden doors. Located at the front of Epcot's Norway pavilion in the World Showcase, this impressive structure is a replica of a Norwegian Stave Church, an architectural design popular in Norway between 1100 and 1200 AD. 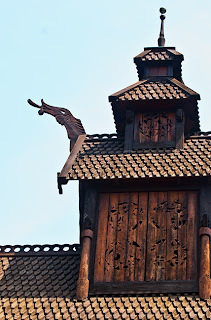 The attention to detail is amazing, from the top of the steeple all the way to the elaborately carved designs facing out over World Showcase Lagoon. Stepping inside is like stepping through a gateway to a different world. It's cool, dimly lit, and quiet. Soft music floats in the air as the doors close and shut out the crowds beyond. 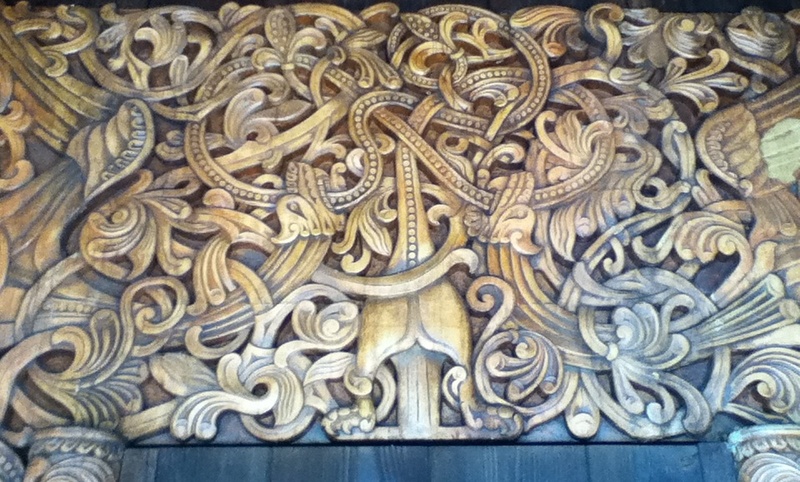 When I'm inside the Stave Church, I feel like I've been transported to another place and time. It's usually not crowded, as many people don't realize you can enter the church. I have often been the only person there- something that's hard to accomplish elsewhere in Epcot! When's the last time you were alone in an attraction? For those of us who can't always visit during low attendance periods, this is a rare treat. 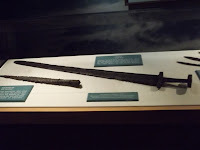 Glass cases display artifacts and weaponry, some over 1,000 years old. 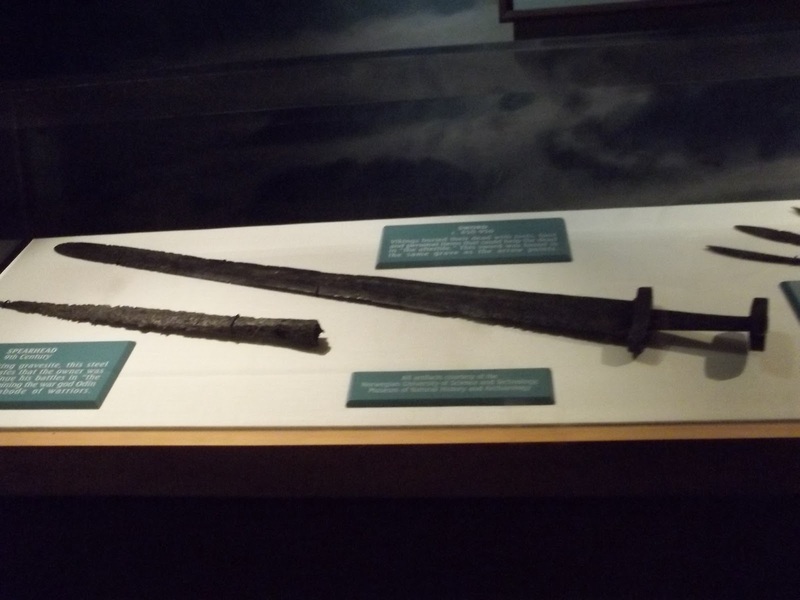 The displays are well-detailed, and I always find it fascinating to look closely at these tools and weapons- the age is staggering, and I can't help but imagine them in the hands of Vikings, sailing the seas. 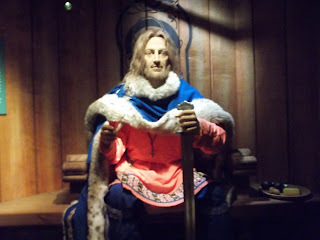 The dioramas showcase Viking exploration. 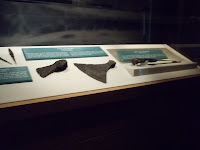 In addition to artifacts, they also include replicas of ships, as well as a few famous Vikings- like King Olaf II. 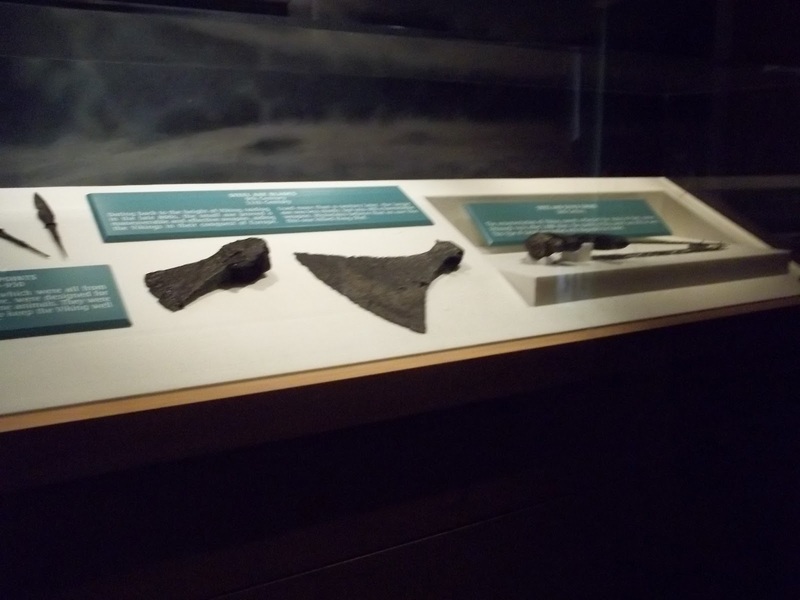 My sister and I spent a very long time standing in front of this case, staring endlessly, searching for a Hidden Mickey that was supposedly on King Olaf II's tunic. We were never able to find it. Apparently this is one of the disappearing Hidden Mickeys- ones that are lost, at least for now. Can you see that fold in the fabric, on the top of his right leg? That's right around the spot the Hidden Mickey used to be. Perhaps a Cast Member shifted the garment the last time Olaf was being dusted? I have spent some time there- for one thing, the steps out front made for a special viewing location for the Tapestry Parade! 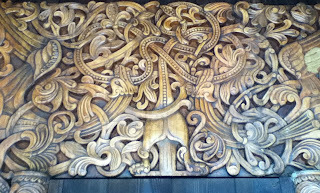 But what got me in was the extreme carving of the doors! I agree- one of the best spots in Epcot! So peaceful. Contemplative. All that history, and ancient beauty, in sharp contrast to the crowds, lights, and newness of most of the World. Love it! Definite MUST-DO for those who have not discovered it. All the times we have been to Epcot, we have never been inside. I now feel like I have missed something & know for sure that the next time I am in Epcot, I will step inside this building. Thank you for sharing. I visited from the Sits Girls. You have a new spot to check out next time! Thanks for visiting the blog! Such beautiful design! I will have to remember this spot when we visit next year. Wow - that is beautiful!! We've only been there once...definitely did not see this! If we ever go again, I will definitely make a point to go there!